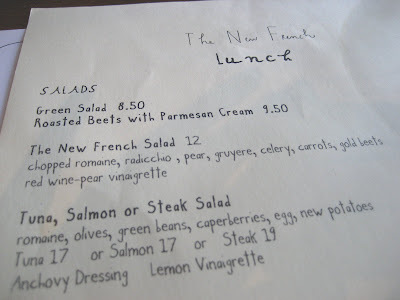 I have been wanting to try The New French at 522 Hudson St., in the West Village all summer, but I hear it is impossible to get in for dinner, so why not try lunch? We went last Monday, parked right in front, and someone even left us an hour & a half on the meter! It was our lucky day, for sure. The New French (who does not have a website), used to be Le Gamin, a little French bistro, though the NEW place has nothing to do with France, except they saved the bistro chairs! 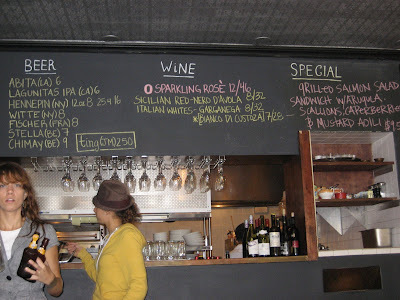 This is an American bistro, very young, very casual, and VERY inexpensive. It's a very small space, with an open kitchen and they serve mainly sandwiches and salads for lunch. I loved the selection. 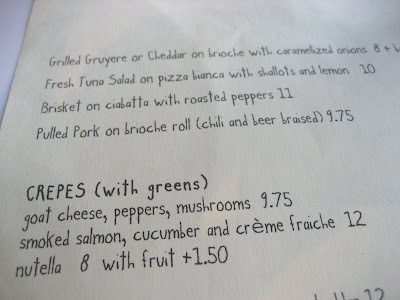 I also looked at the dinner menu, which closely resembled the lunch menu. 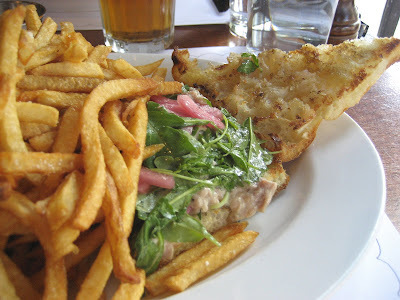 I chose the FRESH tuna sandwich on pizza bianco with a side of fries. The bread was beautiful, crispy and drizzled with olive oil, like a pizza, and the tuna was absolutely delicious. 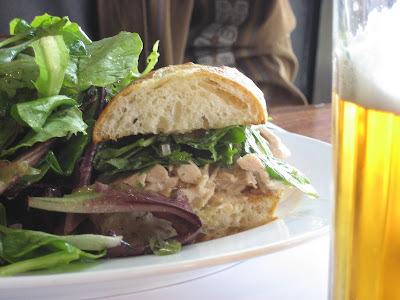 The husband had the chicken sandwich w/ garlic aioli and arugula, and loved it. Both sandwiches were excellent and huge. The fries were a 10. Perfectly cooked, with enough salt, very French. They serve a decent selection of wine and beer. With 2 beers and 2 large sandwiches, the bill was $38. before tip. That's hard to find in NYC. I can't wait to go back and try the crepes and have dessert. Those sandwiches look great! And I won't even mention the fries. Yum. I love Tartine on W. 11th St. too. It's still there. The West Village is my very favorite neighborhood in the city. It's so unique and hasn't been spoiled YET by big box stores and luxury condos. It's coming, though! I'll mention the fries! Yummm! It all looks so good, especially yours!